It seems like when you get one of the Red Bull shirts then you have them all. This is the second one of their teams that I now own, with the RB Leipzig shirt being the first. This shirt is a typical Nike template shirt without any standout features. The sponsor on the front of the shirt fits in nicely with the yellow and red trims. The Red Bull company purchased the club on 6 April 2005 and rebranded it. After the takeover, Red Bull changed the club's name, management and staff, declaring "this is a new club with no history". 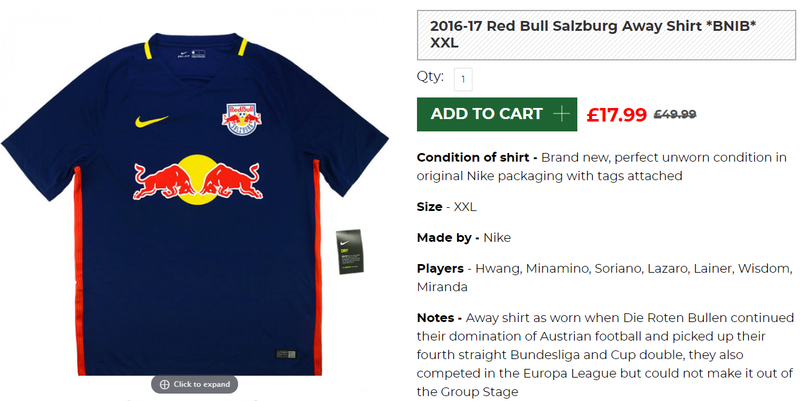 Red Bull initially claimed on the club website that the club was founded in 2005, but was ordered to remove this claim by the Austrian Football Association. The new authority removed all trace of violet from the club logo and the team now play in the colours of red and white, to the consternation of much of the club's traditional support.